Wonton Soup: Wonton soup is one of the most popular soups in street food stalls throughout southern China. A wonton is a type of dumpling commonly found in a number of Chinese cuisines. 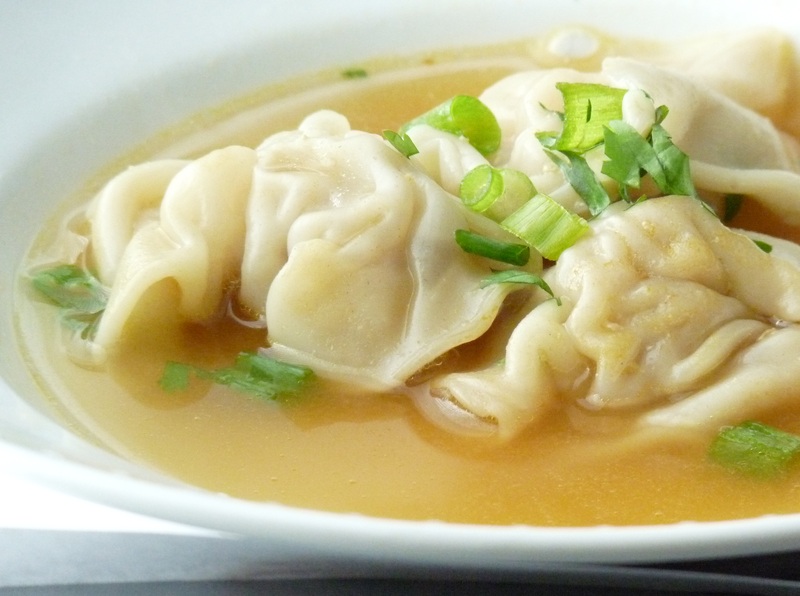 The name wonton means swallowing a cloud and the wonton floating in this popular soup are thought to resemble clouds. Put the prawns and pork in a large bowl. Add in the salt and freshly ground white pepper. Add in all the other filling ingredients. Stir them well into the prawn and pork mixture. Cover the bowl with cling film and chill for at least 20 minutes. Put 1 tbsp of the filling in the center of the first wonton skin. Dampen the edges of the wonton skin with a little water. Bring up the sides of the wonton skin around the filling. Pinch the edges together at the top to seal it, it should look like a small filled bag. Fill the remaining wontons in the same way. Bring the stock, soy sauce and sesame oil to a simmer in a large pan. In another large pan, bring salted water to a boil. Poach the wontons for 1 minute or until they float to the top. Remove them immediately and transfer them to the pan with the stock. Continue to simmer them in the stock for 2 minutes. Ladle the wonton soup into a large soup tureen or individual bowls. Garnish the wonton soup with the spring onions.